When it comes to selecting wireless headphones, it's esssential to ensure that they are attractive, comfortable, and above all else, a real pleasure to use. 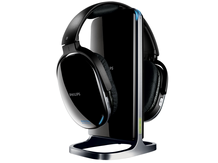 The Philips SHD9100 wireless headphones certainly are attractive, ticking the first box with ease. The glowing blue LEDs on both the polished black headphone cups and the base station itself are lovely to look at, and help add that 'gadget chic' effect to any home cinema setup. The cans themselves are also great to wear. Packing three rechargeable AAA batteries does add a little weight to their presence on the head, and they are a little wide (thanks to housing 50mm drivers). But they feel lightweight, and don't slip about when moving your head to grab a beer or look for the remote. However, the SHD9100s fall slightly on the final category: the sound quality. It isn't the actual acoustics themselves that grate. The sound is bass-rich with some great treble tones, and the mid-range is more than adequate. Sport in particular was a pleasure to hear; the crowd at Wimbledon seemed to be sitting next to you. The problem is in the quiet or silent passages; a small buzzing noise is ever-present and can put the listener off when watching quieter movies. The problem appeared to stem from interference from other devices. Turning off everything other than the TV and Blu-ray player seemed to help somewhat, although the buzzing was still slightly noticeable. Using the headphones on the computer was also out of the question. Not only was the buzzing quite clear, the cans kept turning themselves off when listening to quieter music. And the auto shut-off, designed to save power when no sound was received, didn't seem to be too accurate. The headphones have a six-hour continuous listening lifespan on a single charge. Some might find this too short. But hanging them back on the stand will begin charging instantly, and it's hard to imagine many would be able to exhaust the batteries on a regular basis. At £170, the SHD9100s are a little much for the money. They certainly look the part, as both the cans and the base have a very slick look. Sound quality is more than decent, and the comfort is right up there. But the auto-shut off and slight buzzing, which may be acceptable in a lower-price pair of 'phones, might easily put some off, particularly when you consider the more luxury price point.